How many coats of Stain do I need to apply? If the deck has been properly cleaned, it should absorb the first of stain well in to the wood. By applying a second, light coat of material, you will fill up the cell structure of the wood (kind of like topping off the tank) and the project will last longer. Don’t allow the product to dry out between coats.this is especially true with waterborne products. Most stains will have some type of waxes or paraffins in them, which work to help them repel water. Applying a waterborne material over the top of a dried and cured first coat will result in it being repelled by these waxes, lay on the surface, and eventually peel. this is less about how much and more about how. Direct sunlight will always raise the temperature of the wood and can do so significantly. 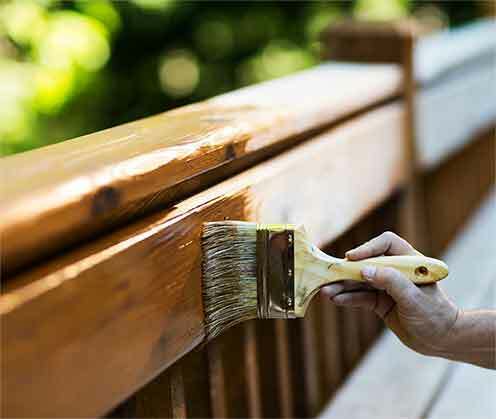 Applying stain to a hot surface will almost always result in a disaster as the stain is cooked by the sun before it has a chance to penetrate deeply in to the wood. Always try to stain in the shade or during the cooler parts of the day. Whether using a sprayer or not, always use some type of brush to either apply the stain or to back brush it after spraying. The brushing will even out the material and the friction of the brush against the board helps to work the stain in to the wood. Failing to do so can often times result in peeling.